Spacious full kitchen, full laundry, with linen, refurbished beachfront central apartment, beach views, very comfortable, large open balcony. One registered guest car space, non smoking, TV, DVD, microwave, ceiling fans. Bring your own toiletries. Please note credit card pre authorisation of $200 required on check in by registered guest. Spacious full kitchen, full laundry, with linen, refurbished beachfront central apartment, beach and ocean views, very comfortable, large open balcony. One registered guest car space, non-smoking, TV, DVD, microwave, ceiling fans. Bring your own toiletries. Please note credit card pre authorisation of $200 required on check in by registered guest. Spacious full kitchen, full laundry, with linen, refurbished beachfront central apartment, queen bed for couples , as well as single bed for child or additional adult , very comfortable, WITH VIEWS. One registered guest car space, non-smoking, TV, DVD, microwave, ceiling fans, balcony. Bring your own toiletries Please note credit card pre authorisation of $200 required on check in by registered guest. Beachfront refurbished apartment with queen, 2 singles for families, beach/ocean views very comfortable open balcony, full kitchen, full laundry with linen. One registered guest car space, non-smoking, TV, DVD,microwave, ceiling fans. Bring own toiletries Please note credit card pre authorisation of $200 required on check in by registered guest. 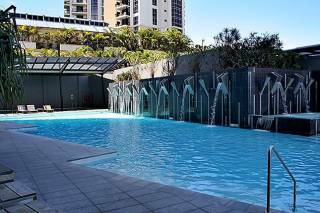 Gold Coast accommodation at Surfers Paradise, beachfront, apartments, with ocean, beach views, in the heart of Surfers Paradise is situated in Queensland on the east coast of Australia for travel and relaxation in the sun and surf. 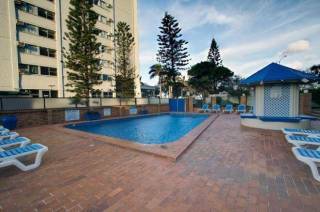 Two minutes to Cavill Mall, shops, transport to theme parks, and across the Esplanade to the famous Surfers Paradise beach - with flags and lifesavers for swimming for tourists. The One and Two bedroom fully self contained apartments are available for the budget travellers. The holiday units have full kitchen,bedrooms, bathroom, lounge, balcony and security parking with linen supplied. Low tariffs and the best location for guests with no car to be situated so close to shops, supermarkets, transport and Friday night markets. Terms & Conditions $200 deposit to be paid on reservation by cheque, money order or faxed credit card authorisation. Balance to be paid one month prior to check in. Reservations made within one month to be paid in full. Payment can be made by visacard or mastercard. We do not accept Amex or Diners. PLEASE NOTE - Credit Card Imprint by a registered guest necessary on check in. HIGH SEASON Prior to 15 November	$55 Administration 15 Nov - 0 days of arrival	No refund of deposit for cancellation notified during this period for high season to 31 January TOURIST/ LOW SEASON Prior to 28 days of arrival	$55 Administration 28 days - 0 days of arrival	No refund of deposit for cancellation notified during this period SHORT NOTICE BOOKINGS Booking made 14 - 0 days of arrival	No refund of deposit for cancellation notified during this period NOTE: Tariff is not refundable for stays cut short.